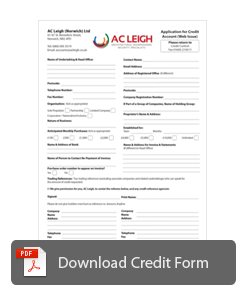 Applying for a credit trade account is easy just download the form below and fax it back to us . If you can provide us with your company registration number and have been trading for more than two years then we do not normally require trade references and can normally open your account within 48 hours. Business credit applies to orders placed on the 1st calendar day of the month and where the calendar month has more than 30 calendar days. Our credit terms are strictly NETT 30 Days End of Month. Any accounts making repeat late payments will have their credit facilities withdrawn.